KOKOMO, Ind. — Working as an artist is usually a solo business. When Minda Douglas, an assistant professor of fine arts at Indiana University Kokomo, is not teaching, she is working alone in her studio. When she exhibits her prints, she usually ships them to the site, and they are shipped back to her, with no interaction with those attending the show. 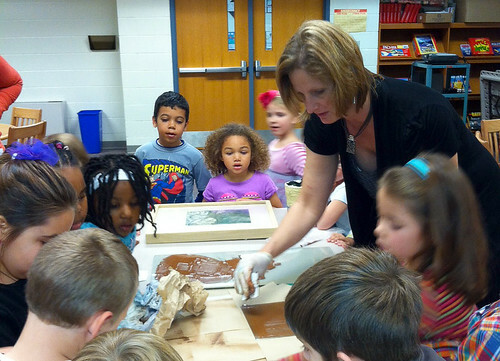 Minda Douglas creates art with Kokomo elementary students.That is why she decided in 2012 to expand the research part of her job, and look for opportunities not only to meet people who view her art, but also to serve as a teacher in her community. She shared her talents as an artist in residence at Porcupine Mountains Wilderness State Park in Michigan, and at Kokomo's Wallace School of Integrated Arts, and as a visiting artist at Louisiana State University. "These were mutually beneficial experiences," Douglas said. "I feel renewed from the chance to work and show my work beyond placing it in an art show. I also made some connections with interesting people. I hope some things develop out of those relationships that can benefit IU Kokomo." Douglas was one of the first artists in residence at the Wallace School of Integrated Arts, a fine arts elementary that opened in August. She and six IU Kokomo students took printmaking blocks and plates, a small etching press, and other materials to the school, and worked with the elementary students to create prints. "They liked feeling the texture of the plates," she said. "I had so many questions from the kids. I was so impressed." Douglas plans to donate a set of the prints she made during her visit to the school's art collection. She intends to return, and to have some of her students volunteer there. "It's a great opportunity for us to work with future artists," she said. "It's also a chance for the children to see real artists at work, and to see art as a potential career option, and as a college major at IU Kokomo." Wallace Principal Charley Hinkle said students enjoyed seeing Douglas model the process of making prints. "Minda was wonderful, sharing and demonstrating the artistic process to our students here at Wallace," he said. "Students observed and were allowed to ask questions about Minda's work and her inspirations. She truly integrated the arts for our students." Douglas was an artist in residence for two weeks in late July and early August at Porcupine Mountains Wilderness State Park, in Michigan's Upper Peninsula. She lived in a cabin in the park, with time to work. In return, she is to create and donate a piece of art inspired by her time in the park. It will be displayed in the visitor's center's permanent art collection. Douglas and her 13-year-old son had to hike to the cabin, as there were no roads to it. They spent their time hiking and taking pictures, which she is using to create her work to donate. "The hope is that the artist is inspired to include the settings of the park in your work," she said, adding that she also gave a lecture during her time there. In late October, Douglas returned to Louisiana State University, where she earned her Master of Fine Arts degree, as a visiting artist. In addition to working with students, she was happy for the opportunity to use the large format printmaking studio. She created two 3-by-5 feet etchings on steel plates, and then made prints from them. The prints, titled "Silent Witness," incorporated Louisiana State's live oaks, which were planted in the 1930s, along with newspaper headlines documenting the lifetime of the trees. As she worked, groups of students watched and asked questions, and provided extra hands to carry the plates to the press and run them through it. IU Kokomo student Cortney Santiago accompanied her as an assistant. Douglas said Santiago is considering graduate school in fine arts, and allowed her to visit Louisiana State's program. "I would like to find other programs like this," Douglas said. "I feel like I've gotten more from this kind of experience than just exhibiting in a show. You sometimes feel alone as an artist. This allows me be part of a community."